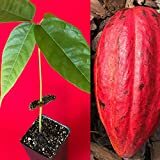 Cacao plants for sale – Easy plant to grow with edible fruits and seeds also grown for the ornamental flowers and for the leaves, planting all year and better to buy plant or another option to start from seeds yet more challenging. Cacao plants for sale – When it’s the season to buy Cacao plants? How is it recommended to start from seeds or plant? Cacao plants season to planting or sowing it’s all the year in colder climate that the plant grows indoor if there is effect of the outside recommend spring or summer.